Reference this document if you are in the process of getting started with Company Surge® for Marketo. Small and medium-sized businesses (SMBs) can be difficult to track down and target online. Bombora's LiveRamp-exclusive audience offering provides a unique and scalable method of reaching SMBs. 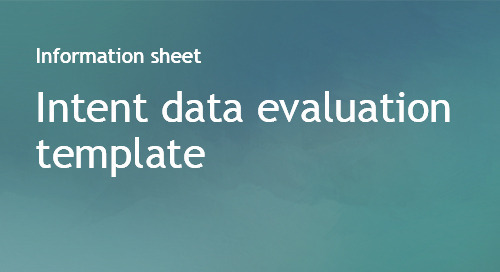 Use this template and the attached spreadsheet to objectively evaluate Intent data providers and their offerings and ultimately choose the right provider or providers for your needs. Learn the steps of analyzing business online content consumption to derive a Topic Interest Score, otherwise known as a Surge Score, which represents a business' buying intent. 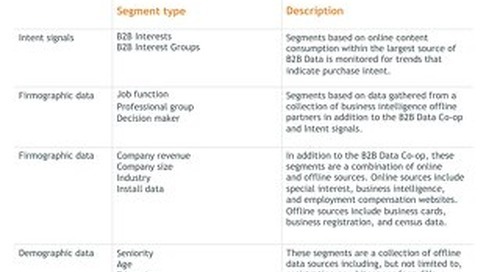 Learn about Bombora's data collection methodology for B2B audience segments. Prioritize sales and build strategy based on data-driven insights from the Bombora B2B Data Co-op. Use your preferred social channel to execute your Account-based marketing campaigns with Company Surge® data. Focus digital advertising initiatives on the target accounts that are in an active buying cycle and tailor messaging to the Intent topics of interest. Learn which B2C demographic segments are available through Bombora's data Co-op including B2C Intent data. Surf the entire list of B2B firmographic and demographic data segments that are available for all digital targeting needs. 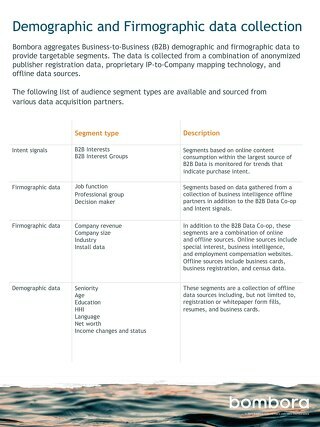 Learn about the scale of the B2B Data Co-op and surf the demographic and firmographic data segments that are available for your digital advertising and other targeting needs. Company Surge® for Marketo aligns marketing and sales teams and operationalize Intent data for engagement or Account-Based Marketing. At Bombora, we recognize the significance of data reforms such as GDPR to our customers and partners. Explore the global coverage of Bombora's B2B Data Co-op to see if the accounts and markets in which you are interested are available. Discover the B2C demographic audience segments available for targeting with Bombora Audience Solutions. Surf the list of B2B verticals that Bombora data covers. Understand the output data from the MasterSurge Reports for applicable customers only. Understand the output data from the All Domains All Topics Reports for applicable customers only. Understand the output data from the All Domains All Topics + Zip Reports for applicable customers only. Discover the various ways to leverage Digital Audience Builder in Audience Solutions to achieve digital advertising reach.